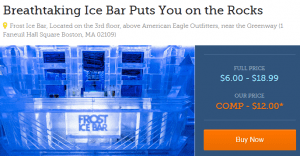 Frost Ice Bar Free and Discount Tickets on Goldstar Boston! Have you been to the Frost Ice Bar yet in Faneuil Hall yet? I haven’t yet because it’s kind of expensive and… cold… two of my least favorite things. 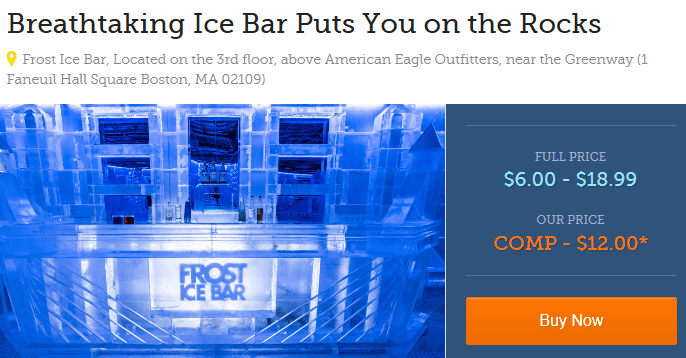 Well Goldstar Boston has discount and free tickets to the Frost Ice Bar on their website! Updated note on 5/16/14: Discount Ticket prices range and availability have changed a few times since November, so make sure you check out Goldstar Boston directly for more details. Make sure to read the terms and expiration of each ticket, because the details of every ticket varies. Also, the Frost Ice Bar becomes 21+ between 4-5pm. For more information or to buy discount Frost Ice Bar Tickets, please head here. Have you been to the Frost Ice Bar yet? Please let me know what you think in the comments below! I am an affiliate partner of Goldstar, please see my disclosure policy here.